Can I Lose Weight With Just Strength Training? Weight loss occurs when more calories are burned than consumed. This is typically done by reducing your daily caloric intake and increasing the amount of exercise performed. Weight loss can occur through strength training alone. However, making changes in your diet and including some aerobic exercise into your routine will increase your weight loss success. 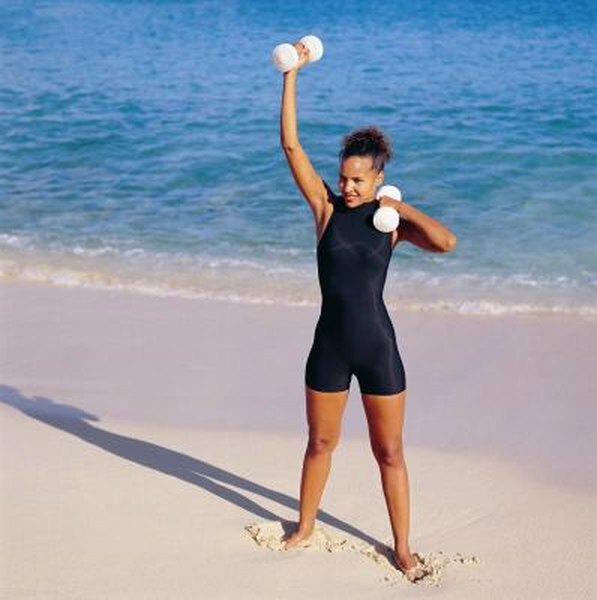 Strength training does not burn as many calories as aerobic exercise does. However, strength training does increase lean muscle tissue, and the more muscle tissue you have the more calories you will burn. As you increase the amount of muscle you have, you will also increase your resting metabolic rate, according to the American Council on Exercise. This increase in your resting metabolic rate can result in a decrease in body fat. However, muscle tissue is denser than fat tissue, meaning that while you may be losing fat weight your total body weight might not change because of increases in muscle mass. Increasing the intensity of your strength training sessions can help to burn additional calories. Limit the amount of rest to under 60 seconds. The shorter the rest periods the higher the intensity and the more calories you will burn. Eliminate rest periods entirely by alternating between muscle groups -- such as performing an upper exercise followed by a lower body exercise, or by including cardio bursts between sets such as running or jumping rope for one or two minutes. Performing compound exercises such as squats, deadlifts and pullups that target multiple muscle groups will increase the intensity, as well as using a weight in which fatigue is reached after eight to 12 repetitions. Successful weight loss will occur with a combination of dietary changes and exercise. When strength-training is your only form of exercise, closely monitor the number of calories consumed in a day. A reduction of 250 to 500 calories a day can result in about a one to two pound weight loss a week. Additionally, building muscle tissue requires amino acids to repair and build muscle tissue found in lean protein sources such as poultry, fish, whey and lean beef. Aim to get about 20 percent of your total daily calories from lean protein. Aerobic exercise will help increase weight loss by burning extra calories. At least 30 minutes of moderate-intensity exercise such as brisk walking is recommended five days a week, according to the American College of Sports Medicine. The 30 minutes can be broken up into smaller segments throughout the day if necessary, or added to the end of your strength-training workouts. Additionally, being more physically active throughout the day will help with weight loss.